Create memories in this newly remodeled 3 bedroom 2 bath house in downtown Brevard, home of the white squirrel. This home has just been lovingly redone with a new gas furnace, new custom tile showers, new flooring (no carpet), new paint inside and out, new washer and dryer, all new LED lighting and new decks. This home is in the West Brevard art district and on the bike path. Enjoy a cold one at the 185 King Street club or the Squatch bike store, for dinner, try Magpie Meat and 3 for a true farm to table experience with great tap selection. Just steps from downtown provides an excellent way to walk to many fine eateries and enjoy the artwork of Brevard. Very close to this lovely home is the Sculpture Walk Tour that celebrates 19 different native species to the Brevard Area. Not only is a Brevard a walkable town but it features many art galleries, pubs, soda shop, bakeries, all found on yelp. Modern styling with a retro touch, brushed nickel finishes, good natural light. Carport and garden hose for washing bikes. Concrete, level drive. Close to Bracken Mountain Trails and Brevard Music Center. Very helpful team member Jana. Felt like our home away from home! It was a cute house, very comfortable and equipped with every thing we needed. We thoroughly enjoyed our stay at 32 Tinsley Road. The house was very clean and comfortable and within walking distance to downtown. We absolutely loved everything about this house and would definitely stay here again if we return to Brevard! Perfect location, beautiful decor, and the added perk of a friendly cat visiting the porch every day! 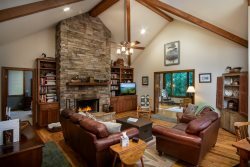 Perfect location to access Pisgah National Forest. We enjoyed the short walk to downtown Brevard for food and entertainment. The house is well equipped and brand new! The car port is a great touch :) thank you !! This charming house was convenient to everything, well supplied and tastefully decorated. We were close to everything downtown.